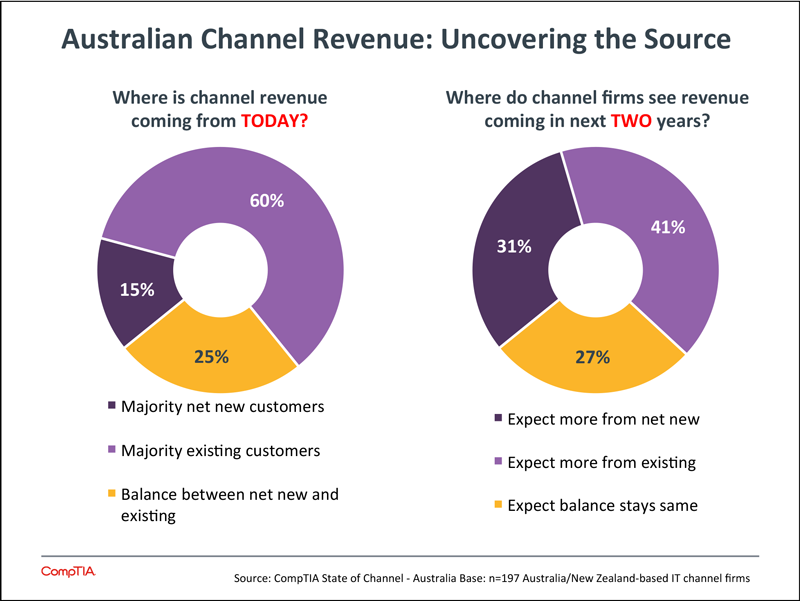 Where to next for Australia’s Channel firms? 10th May will see me back in Sydney for the Business Technology and Services Conference (BTAS 2016). We work with a number of MSPs in Australia and I attend industry events there regularly. 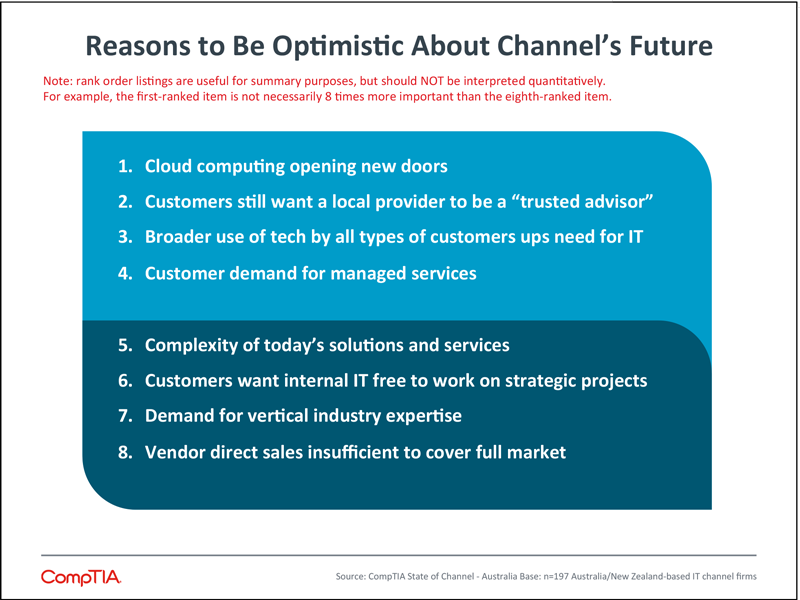 So when I noticed that the CompTIA’s ‘State of the Channel – Australia’ report was available to CompTIA members on their website, I was keen to see if the survey findings reflected my own conversations with MSPs there. The findings certainly make for interesting reading and reveal an industry in transition – though not necessarily in a positive way. While slightly more than half of Australian respondents (52%) are “generally optimistic” about the changes that lie ahead in the channel (a figure equivalent to that of UK respondents, though distinctly lower than the US figure of 61%), there is a higher level of pessimism among Australian respondents: 14% admit to feeling “generally pessimistic” (a little higher than the 12% equivalent UK figure); and more telling perhaps, some 7% Australian respondents admit to “not knowing” what the future holds – as against 2% in the UK. The remaining 28% admit to having “mixed feelings” about what lies ahead. 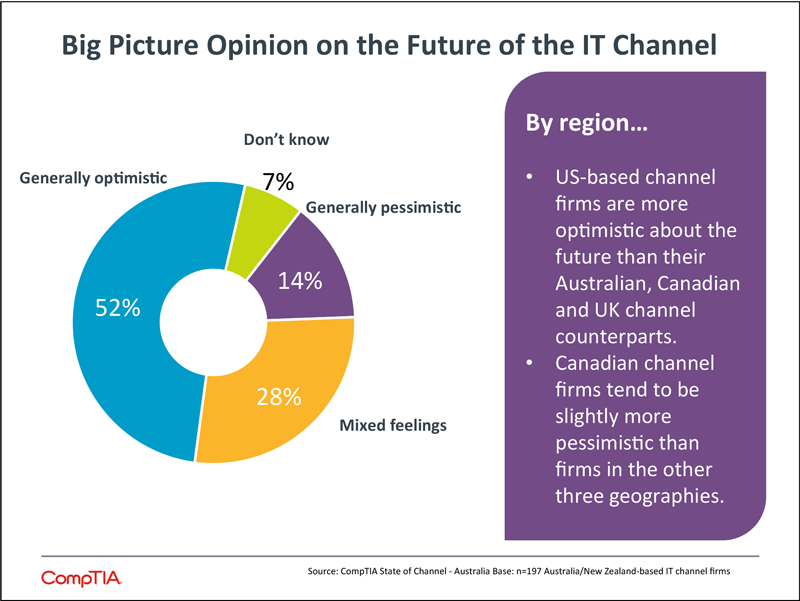 In effect, one in five respondents in Australia has either a negative view of what the channel future holds – or simply doesn’t know what that future will look like. Delving down in to the detail reveals some of the reasons. One factor is the entry of new types of competitors (including telecoms services, digital agencies, ISVs and application developers) into the Australian channel. This is worrying a lot of people. A further cause for concern is the skills gap for in-demand IT. The complexity of IT today is an opportunity for channel firms – but only if they have access to the right kind of resource. Then there is concern about the shifting nature of vendor relationships: one third of Australian respondents reported channel conflict with vendors increasing over the past two years with many citing vendors increasingly selling direct rather than through the channel. At the same time, thanks to the ‘as a service’ IT model, channel firms are selling their own products and services alongside those of their vendor partners. As a result, some firms are cutting ties with their current vendors and/or exploring opportunities with new partners. In many cases, cloud is driving changes in the partner business model: 40% respondents said they would abandon a partner program because their products “were no longer a fit for their customers or their own business model”. But if you are going to rely less on a vendor’s products for revenues – what do you replace this with? Moving to a new business model? According to CompTIA’s findings, channel firms are looking to consulting and other services (integration, implementation, software development, cloud and managed services) to make up the shortfall, with growth expected to come from one-off projects (43%), recurring revenues (42%) and with product sales bringing up the rear (39%). And who will those revenues be coming from? It is quite clear from CompTIA’s findings that over the next two years, the focus will be on finding new customers: more than twice as much revenue is expected to come from new customers than currently: 31% as opposed to 15%, with an expected significant downturn in revenues from existing customers from 60% to 41%. All is not doom and gloom in the Australian channel, however! While acknowledging their concerns, respondents also identified areas of opportunity: cloud computing “opening new doors”; the ongoing requirement of customers for a local provider as a “trusted adviser”; a broader use of technology (coupled with the increased complexity of today’s solutions and services) driving the need for IT engagements around integration, customisation and IT management and the ongoing customer demand for managed services, to pick out the top five. Channel firms are responding to these changes in various ways: some will shift their business model entirely to managed services or cloud; others will adopt a hybrid model, adding services alongside a product-based revenue stream. Whichever route they adopt, they will need the time to focus on developing and marketing the new business model – plus, crucially, access to the skilled resources necessary to deliver against it. It would therefore make sense to offload some of the day-to-day ‘heavy lifting’ to a partner, freeing up internal resources to focus on higher margin, in-demand projects – and developing the vital new customer relationships. Using a partner to handle NOC and Service Desk is an ideal place to start and it is one that I explore in my recent blog. I will be at the Business Technology and Services Conference (BTAS 2016) in Sydney on 10/11th May. If you will be there, please call by our booth [number, hall] – I would be delighted to hear your own experiences of the Australian channel.